* Mirror Polished Finish Innovative Bold Styling: Whether your replacing your cracked factory plastic door pins or upgrading the look of your muscle car you can't go wrong with UPR's Billet Designer Billet Style Door Pins for your 2005+ Dodge or Chrysler. 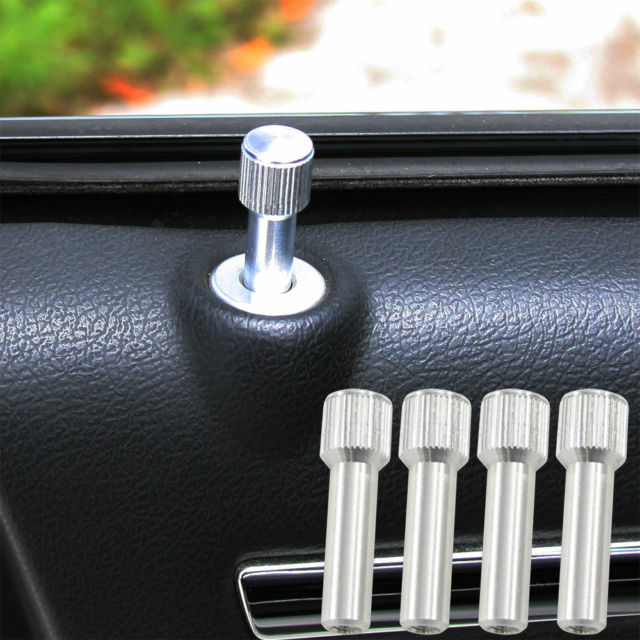 Simply unscrew the stock door pins and screw in the new ones and change the look of your interior in a matter of minutes. Also included in this package is our popular door pin bezels. Quality Construction: No one else can Stack up to the bold clean styling of our aftermarket Billet / Stainless Steel Dress Ups, Street / Strip / Racing Suspension and Performance Parts for your American Muscle Car! Installs in minutes with nothing more than your fingers. Click Here for Instructions Fits these Vehicles: 2005 2006 2007 2008 2009 2010 2011 2012 2013 2014 2015 2016 2017 Dodge Magnum Charger Challenger Chrysler 300 R/T SRT8 Hemi Mopar. Made in the USA!